The Other Side of Spartan Sports: Expanded Breslin Parking? More parking should soon be available for Breslin Center, as well as Spartan Stadium and the west side of campus in general. This is because the State Police, who currently occupy the building just to the west of the Breslin Center on Harrison Road, are expected to move into their new headquarters in downtown Lansing in January 2010. 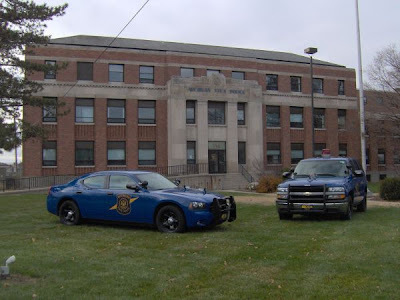 The State Police have occupied the 23 building complex since 1917, but they technically lease it from Michigan State University. When they move to their new facility, control of the sixteen acre complex will revert back to the Michigan State University Board of Trustees. From there, the best bet for its use will simply be a parking lot. According to Campus Planning & Administration, the site is "earmarked for peripheral parking" consistent with the Campus Master Plan. "The university has informally conceived numerous land use options for the site," said Steve Troost, Campus Planner. "I do not know of any final plans at this time other than, some or all of the site will be used for peripheral parking." A sticking point for the University may be what to do with the main Administration Building and Mapes Hall. While the entire site is technically listed on the State Register of Historic Sites, those are the two most visible and historic buildings. Because of their age, it is doubtful that the University would have any suitable use for them, and will most likely seek to demolish them rather than pay for the upkeep of unused buildings. But, because of their historical significance, there may be some opposition to this plan. Regardless of the final outcome, once control of the site is returned to Michigan State, fans should expect an expansion of their gameday parking options. This will be especially useful during basketball season, as the site will provide closer parking than the lot at Spartan Stadium, where many fans who cannot park in the lots to the east of Breslin currently go.